Im not gonna toot my own horn here. Ummm...screw that I will, this is the best pumpkin bread I have ever eaten. Now I know some people have unnatural hatred of all thing pumpkin but I'm not one of those people. Gimme that pumpkin spice lattes and candles and breads n all...give it to me I don't care. Pumpkin is delicious, low calorie and it goes into everything. I usually make my banana bread with this sweet cheesecake mixture filling so I decided to put it into this pumpkin bread and it turned out fantastic! If you have, use an electric mixer to combine these well. I added a spoon of honey just to give it more flavor. 1/2 cup of greek yoghurt (yoghurt gives any bread load moistness) I refuse to bake without it. Mix all this with electric mixer. Now you have 3 different bowls of 3 different textures. Fold the dry mixture into wet little by little so that flour does not clump. Use a whisk or something. Grease a loaf pan really well. Put one half of the bread mixture on the bottom. Spread the cream cheese filling on top of it. Pour rest of the bread mixture on top and bake for about an hour at 325F. My oven is pretty strong since its a gas oven. Electric ones may need more time. Use your best judgement. Toothpick in the middle is a good test. If it comes out clean, the bread is done. You don't want to overcook it otherwise it it will be too dry. Enjoy! 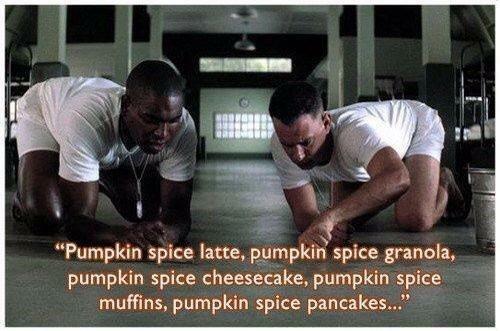 YAY PUMPKIN SPICE EVERYTHING! HAPPY FALL FRIENDS!